Federal investigators have found that an East Coast school which had planned to sell Native objects in its possession is subject to the Native American Graves Protection and Repatriation Act (NAGPRA) and is not in compliance with the law. The U.S. Department of the Interior has given the Andover Newton Theological School (ANTS) of Massachusetts 45 days to respond to its decision, which was issued in late September and recently obtained by Sealaska Heritage Institute (SHI). The decision sends a strong message to institutions that own Native collections and receive federal funding, said SHI President Rosita Worl, who filed the complaint earlier this year in an attempt to stop the sale. “The ruling was forceful and very clear, and there is no room for misconceptions. If an entity owns Native objects and receives federal funds, they must comply with NAGPRA,” Worl said. The collection contains 1,100 objects, including 125 works of Native American art representing fifty-two tribes in the United States and Canada that have been accessible to the public through the Peabody Essex Museum, which notified tribes in June about the planned sale. 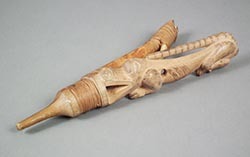 SHI’s Council of Traditional Scholars confirmed in July that at least one object in the school’s possession—Gooch Kuyéik Náxw, or Halibut Hook with Wolf Spirit—was a sacred object and object of cultural patrimony. In its complaint, SHI argued that the school was subject to NAGPRA because it processes federal student aid funds. In the September letter to the school written by Principal Deputy Assistant Secretary for Fish and Wildlife and Parks Michael Bean, the federal government found that ANTS is subject to NAGPRA because it receives financial assistance through the U.S. Dept. of Education. The agency also found that the school had control of at least one NAGPRA cultural item, the Gooch Kuyéik Náxw, which is “both a sacred object and an object of cultural patrimony, as the terms ‘sacred objects’ and ‘cultural patrimony’ are defined under the Act,” Bean wrote. The agency found that ANTS is out of compliance because it failed to complete a summary of its collection for Indian tribes or Native Hawaiian organizations by April 20, 2010 as required by NAGPRA. “I have determined that the alleged failure to comply has been substantiated. Additionally, the Department of the Interior wishes to advise you that the National NAGPRA Program is ready to assist Andover Newton in achieving NAGPRA compliance,” Bean wrote. The agency has given the school 45 days to seek informal discussion with the Secretary of the Interior’s designee—and/or request a hearing to contest the finding, or take no action and await a notice of assessment. Although the decision is a victory for tribes across the country, the experience underscored the need to amend the rules to ensure that institutions that are subject to NAGPRA are following the law, said Worl, noting the burden currently is on tribes to seek investigations on compliance. At its convention last week, the Alaska Federation of Natives passed a resolution to form a group to study the issue and propose changes at the national level, Worl said. That resolution was driven by this case and the publicity it has received across the country. Caption: Photo of Gooch Kuyéik Náxw, or Halibut Hook with Wolf Spirit, from the Peabody Essex Museum.